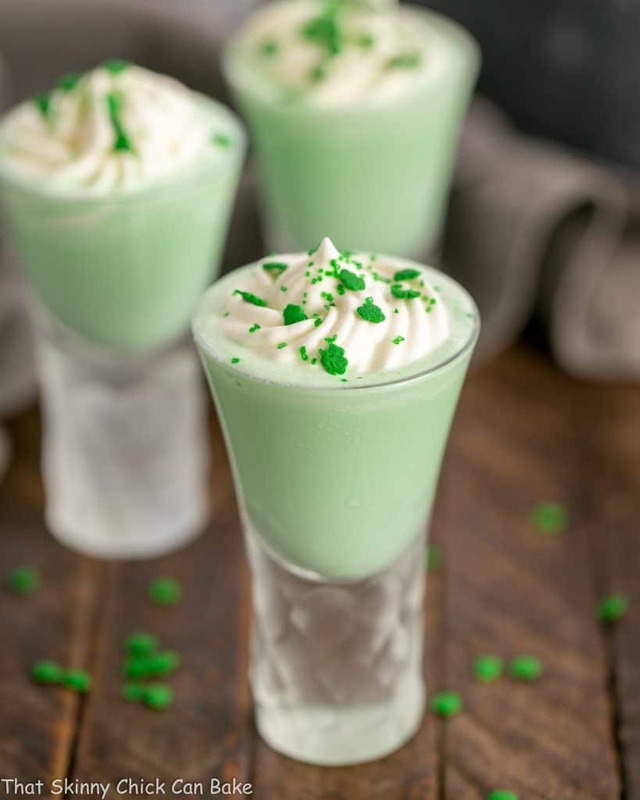 Shamrock Shooters with Creme de Menthe are a grownup shamrock shake! 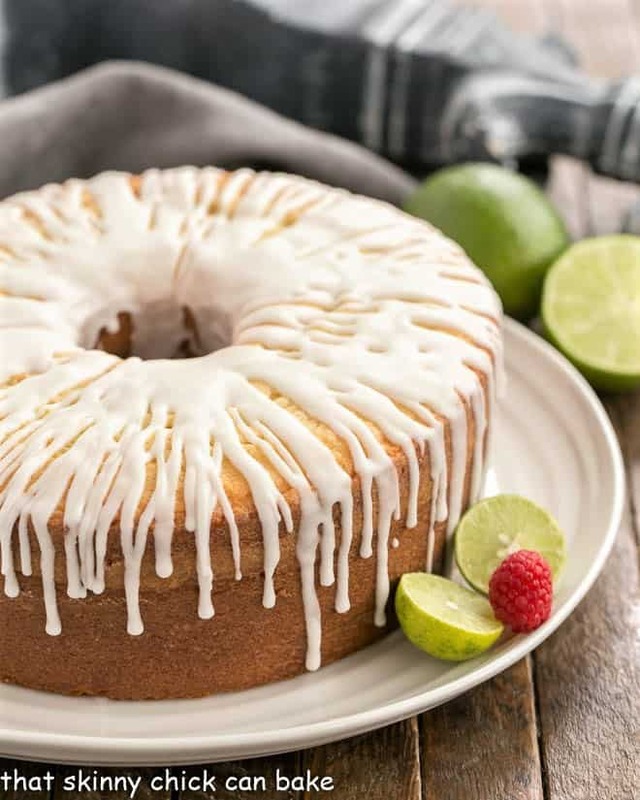 But leave out the liqueur and they’re perfect for the whole family! 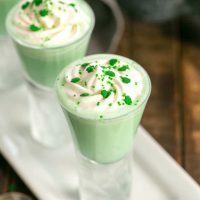 These shamrock shooters echo the flavors of the Grasshopper Pie I make every 4th of July. My kids ALL love mint desserts. We’ll ignore the hubby’s opinion as he’s like Mikey, he hates everything (or so it seems some days!). 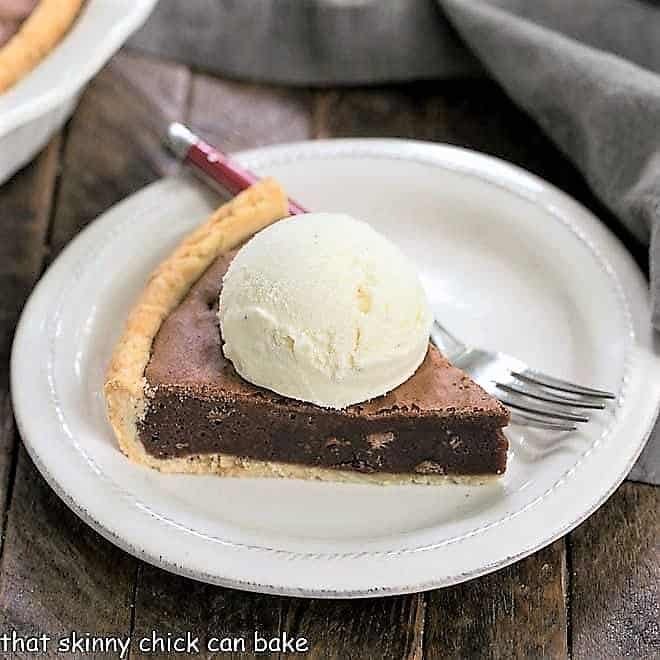 Instead of the whipped cream and marshmallow cream used in the pie, I added vanilla ice cream to the blender along with some milk, peppermint extract, and the requisite creme de menthe! Green food coloring doesn’t hurt, especially when you’re serving these frozen delights for St. Patrick’s Day! 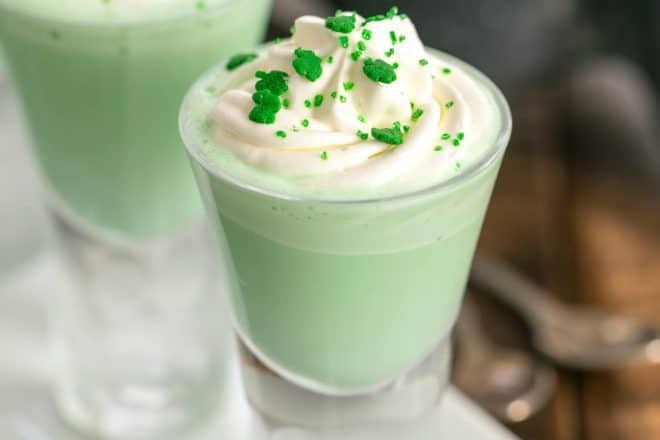 As a non-alcoholic option, the creme de menthe can be eliminated and green food coloring and a smidgen of peppermint extract will supply the needed components for a green minty shake. Do you like peppermint flavored treats? What’s your favorite?? Double the recipe to make two full sized milk shakes. Leave out the creme de menthe for a non-alcoholic or children’s version. Peppermint extract is very intense. Don’t be tempted to add any extra without sampling first. 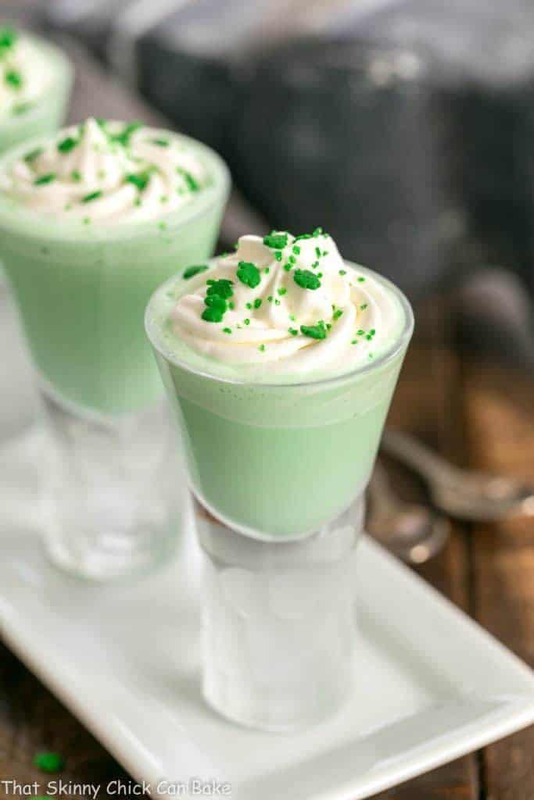 Top with sweetened whipped cream for the ultimate shamrock shake experience along with shamrock and green sugar sprinkles. You might also like to add a drop or two of peppermint extract to the cream. Use any small glasses to serve, like shot glasses, cordial glasses. The number of servings will vary depending on the size of your glasses. Place the ice cream, milk, food coloring, extract and creme de menthe (if using) in a blender. Process just until smooth. Pour into shooter glassed and top with whipped cream and sprinkles. Serve immediately. I love creme de menthe! 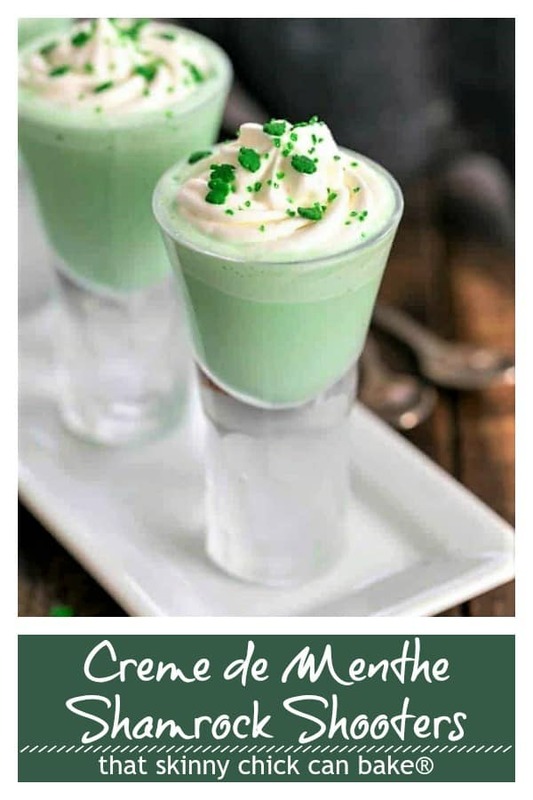 I love how festive these are, perfect for a St. Paddy’s day party! these are so refreshing looking. its been hot here cant wait to have one! 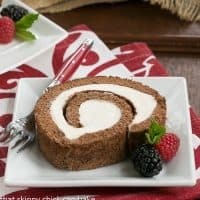 What a fun and pretty dessert for St. Patrick’s. I love love creme de menthe, or anything mint for that matter! Unfortunately, my Bill is like yours, and doesn’t like anything with a mint taste. 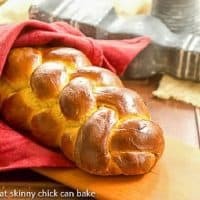 I would love to try your shooters, yum!!! Pretty color too! 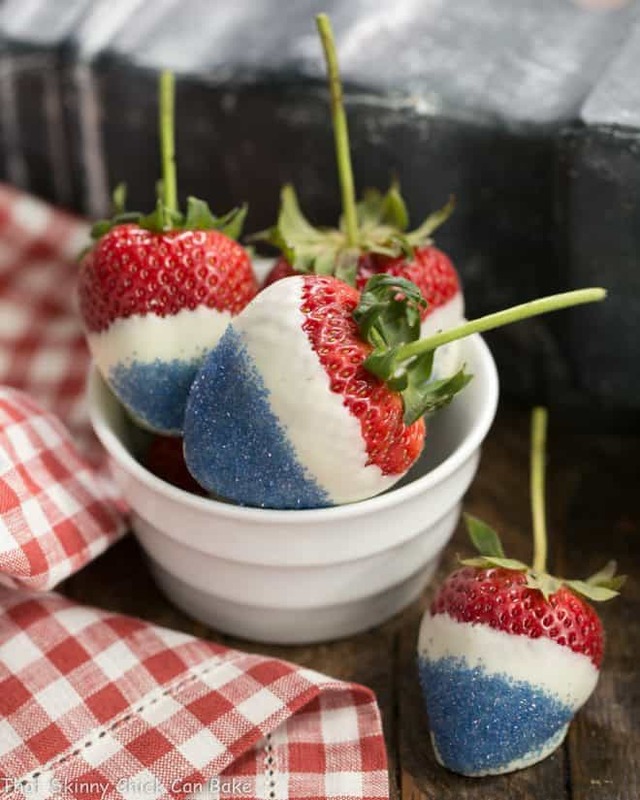 Don’t these look fun! I love the color and perfect for St Patty’s Day. You’re amazing, you never miss a post or holiday. Impressive! Thank you for the article Chris. They look so refreshing Liz!! 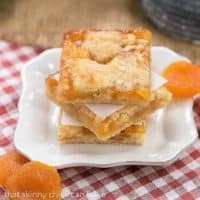 Using the vanilla ice cream makes it so easy and quick to make these!! Sign me up for one (or two!) of these shooters! These look stunning, and I’ll bet they taste even better than they look. So perfect for St. Pat’s! Thanks so much. These will make St. Patrick’s Day a whole lot more fun! Perfect for the day! Perfect for most any day. I’ve never had a shooter! Guess that better change soon! My goodness these look good. I miss mint so much since coming to France since the French are weirdly just not into it that much and – like your Bill – my Antoine is so fussy on the mint. 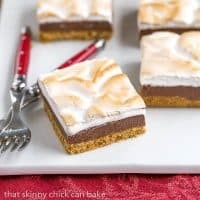 BUT I’d make these just for myself! They look fabulous, Liz. Great idea for Saint Pat’s! I love mini desserts! These mini shooters look amazing. These would be refreshing any time of the year and the presentation is beautiful. These look so awesome and yummy, I may have 3 in a row. Happy Saint-Paty’s Day! I could seriously go to town on these! One little shooter would not be near enough. 🙂 Happy St. Patrick’s Day!